You've found the “U.S. Yorkshire Pig Breeders” page here at Hobby Farm Wisdom! If this is the first time you have visited our site: Welcome! Yorkshire, also known as Large White, is a breed of domestic breed native to Yorkshire. There is also an American counterpart, known as the American Yorkshire. These pigs are the most recorded breed of pig in the United States. This breed was not popular after initially being imported from England in 1830. However, in the late 1940s, they were imported from Canada and England again and the breed rapidly started improving. 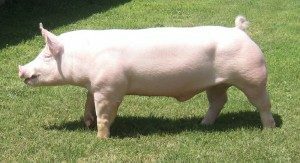 Frequently called the “Mother Breed”, these pigs are known for their ability to farrow and raise large litters of pigs. Yorkshire pigs produce a high proportion of lean meat due to its muscular composition. They can be found in every American state but are most common in Illinois, Indiana, Iowa, Nebraska and Ohio.